The deadline for submissions for the GMD Poetry Competition is 1st December 2019. The rules, terms and conditions and further details are posted below. The competition is open to anyone in the UK aged 11 to 18 at the time of entering. The closing date for entries for this year’s competition is 1 December 2019. Winners will be announced on or around GMD 2020. The competition is held every year as part of GMD. 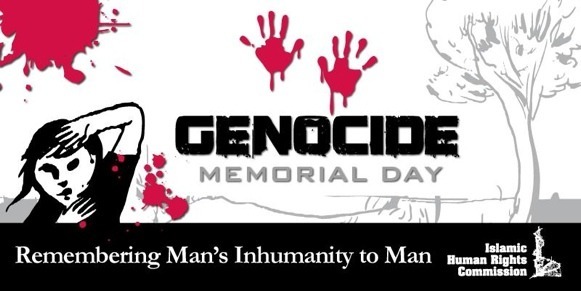 Entrants are encouraged to reflect the theme of ‘protecting humanity from genocide’ in their poem. Poems should be respectful of the topic. First Prize: Paid trip to Bosnia with an accompanying adult in July covering the date of the annual Srebrenica memorial. Includes flights, accommodation and meals. Winners will visit key sites in the war with a guide to the events that took place. Second prize: £50 IHRC Bookshop voucher. Third prize: £25 IHRC Bookshop Voucher. All winners will be awarded a certificate of achievement. In addition to or individual prizes, IHRC will be offering a prize to the school which has entered the most entries. Details of the 2020 prize will be announced soon. The school prize for 2019 was a screening of the documentary ‘Forgotten Genocide’ with a Question and Answer session with the film’s director and writer, Assed Baig. Baig is a reporter with TRT World and formerly worked with Channel 4 News and Anadalou Agency. All entrants should read the Rules carefully before entering here. The Terms and Conditions for the competition and its prizes and can be found here. Each year a panel comprising poets, artists, community figures and an IHRC officer judge the poems. Previous judges have included poets Narjis Khan, Sanasiino, Zainab Ali, Suhaiymah Manzoor-Khan and Ibrahim Sincere and community figures like Bruce Kent. Each year’s judging panel will be announced after the judging has taken place. A compilation of winning entries is being compiled for publication summer 2019. All profits from sales will be donated to the IHRCT Rohingya Fund.